Reset your day with these calming fragrances and lull your mind and body into that lazy-day feeling. Unwind and daydream with subtle scents of lavender and mint swirling in the background. Take a long stroll through a minty forest or drink in the relaxing and refreshing effect of white tea and figs. Soft cooling mist of lavenders and citrus with subtle backdrop spice and florals. Top notes: fresh, clean, cooling. Middle notes: smooth lavender and patchouli with hint of citrus and peppermint. Base notes:touch of spice, florals, and warm musky undertones. Creamy, sweet vanilla combined with warm floral notes and soft musky undertones. Lemon blended with green tea and other spices, musky base. 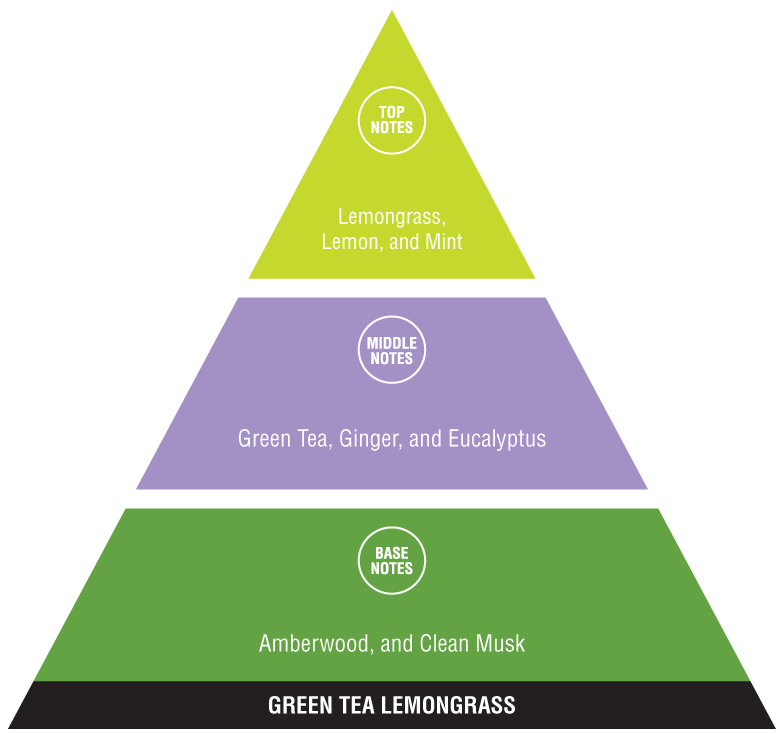 Top notes: lemongrass, lemon, and mint. Middle notes: green tea, ginger, and eucalyptus. Base notes: amberwood and clean musk. Bright blend of citrus and light florals on a bed of sweet vanilla. Top notes: citrus, sweet vanilla. Middle notes: smooth, soft green florals. Base notes: woods with musky undertones. Bright ensemble of lavender and citrus with soft floral and musky undertones. Top notes: clean, fresh, citrus. Middle notes: lavender blossoms with citrus highlights. Base notes: peppery, woody, and soft floral undertones. A calming, fresh breeze of lavenders and fruit with woody, musky undertones. Middle notes: lavender blossoms and a soft fruity blend with leafy nuances. Base notes: woody and spicy with soft florals and musky undertones. Crisp and minty blend nestled in pine in the great outdoors. Top notes: clean and crisp with touch of spice. Middle notes: mint and wintergreen mixed with rich spruce and woody nuances. Base notes: herbaceous with woody undertones and hint of sandalwood. Lie down in a field of lavender and sweet vanilla while sipping on lemonade. Top notes: clean and fresh with vanilla and hint of lemon. Middle notes: lavender blossoms with soft florals and citrus undertones. Base notes: woody with floral and musky tones and peppery nuances. Soft bouquet of florals swaying in clean, soft breeze. Top notes: soft, clean, marine air. Middle notes: rose, lily, green floral. Base notes: musk, amber, violet. Vanilla waves wash over as a cool spray of wintergreen gently falls. Top notes: cooling with sweet vanilla. Middle notes: soft florals and wintergreen. Base notes: warm musk and herbaceous undertones. A luxurious bath of cooling herbs and citrus with vanilla bon bons. Top notes: clean, cool, citrus, hint of vanilla. Middle notes: leafy with tart lime and floral nuances. Base notes: herbaceous undertones, floral nuances and warm musk. Middle notes: smooth and soft floral nuances. Base notes: warm and musky tones. Soft, sweet blend of vanilla and lavender. Top notes: sweet vanilla with a blush of lavender. Middle notes: soft florals with hint of lavender blossoms. Base notes: warm and musky tones with floral nuances. Warm, long lasting vanilla aroma. Top notes: sweet floral and coconut nuance. Middle notes: vanilla bean and creamy vanilla. Base notes: sweet sun-kissed hay. A warm garden of vanilla backdropped with leafy greens and florals. 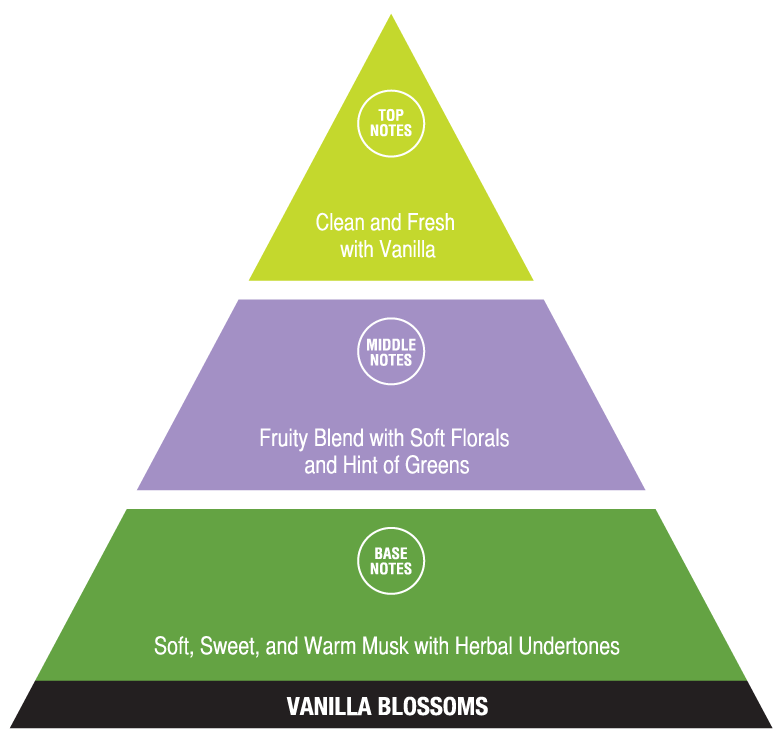 Top notes: clean and fresh with vanilla. Middle notes: fruity blend with soft florals and hint of greens. Base notes: soft, sweet, and warm musk with herbal undertones. This comforting citrus floral pairs the sweet, mild fragrance of white tea leaves and lemon with a garden bouquet of violet and thyme. Top notes: bergamot, lemon, tea leaves. Middle notes: jasmine petals, thyme, violet.